Pool Deck and Patio Repair and Resurfacing. Residential and Commercial Services. 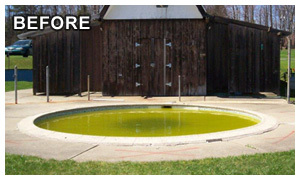 Professional Swimming Pool Deck Resurfacing means No More Ugly Concrete. Whether you have old, cracked, previously coated concrete surfaces or newly poured concrete pool decks or patios that need resurfacing let us show you what we can do for your Ugly Concrete Decks and Surfaces! 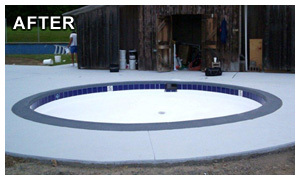 Finally, a concrete pool deck finish that combines beauty, durability and economy in one product. Kover Krete™ is designed to cover new or old concrete with a strong, long lasting decorative protection. Ideally suited for commercial and residential uses, it levels and restores old surfaces and adds years of life to new ones. We have been repairing, restoring, resurfacing and preserving pool decks, patios and pool coping since 1989 using Kover Krete™. Kover Krete™ adds beauty to any environment. Create your own design through a wide variety of available colors, styles, and methods of application. Kover Krete™ lets you enhance virtually any concrete surface at a fraction of the cost of replacement. Kover Krete™ products have been proven effective worldwide to repair, protect and beautify existing surfaces. The Kover Krete™ Acrylic Resurfacing System is an acrylic cementitious coating system for commercial and residential pool decks, patios, walkways and entrances; it combines the durability of concrete with the versatility of colors, styles and textures. 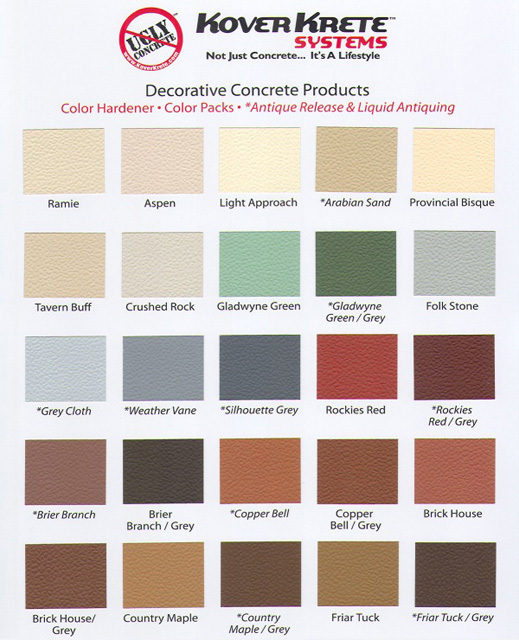 Kover Krete™ colors come in a wide variety and can be matched to any custom Color. View our Color Chart for details.